The winemakers approach at Ravenswood Winery is to educate patrons in a bold, hands-on experience. 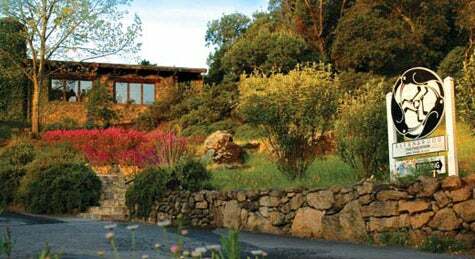 Ravenswood Winery began life in 1976, when Winemaker Joel Peterson scrambled to harvest eight tons of Sonoma County Zinfandel before the rains fell. A student of Native American mythology, Joel knew that the raven was a trickster who taught humans how to survive. Joel learned well. "In the 1960s and '70s, " he recalls, "The European wines I admired were made in a relatively primitive way, without much technological interference. I didn't see why Ravenswood couldn't employ Old World methods if we were vigilant. Why eliminate a time-honored tradition by substituting technology that's more like food processing than winemaking?" Because of this philosophy, Ravenswood employs relatively archaic winemaking techniques. For example, instead of sterilizing their grape juice with sulfur and adding a commercial yeast culture, the winery uses native vineyard yeasts that have a broader range of flavors and aromas. They also ferment in small, open-topped tanks and allow the temperature of the juice to get very warm to extract all the color and flavor possible. The wine remains in contact with its skins for weeks, not days, after which they age it in small French oak barrels. Working with different Zinfandel growers, Joel discovered that many of these meticulously farmed vineyards yield distinctive flavor profiles from specific spots. The result is Ravenswood's prized Vineyard Designate Series. These unique, handcrafted wines are very limited in production and are only available to taste at Ravenswood's Visitor Center. But that's just one reason people visit Ravenswood. The winery is a regular "Department of Zinformation," with fun educational programs to help guests improve their wine IQ. There's even an official wine educator on staff who, each morning, guides visitors through the historical Estate Vineyard, with some of the area's oldest clones. From there, he shows them the barrel room and Ravenswood's "non-wimpy" winemaking process, and often shares a taste--right from the barrel. Each morning, weather permitting, a vineyard estate tour is offered. And for a hands-on lesson, visitors can reserve a spot in a Blending Seminar. It's no wonder visitors often return the next day to further their education and enjoy Ravenswood's distinctive tasting room-only wines. From CA-12/121, turn right on Napa Rd. Turn right onto 8th St E. Turn left on E. MacArthur St. Turn right on 7th St E. Turn left on Lovall Valley Rd. Turn right on Gehricke.